Abandoned by her mother at a young age, seventeen-year-old Sydney Warner is always vying for attention. She's a thrill seeker with a penchant for extreme sports and a fascination with death. Withdrawn and broody David from English class is the boy of Syd's dreams, but love soon becomes just another extreme sport when Syd finds out that David has cheated on her. Betrayal, loneliness, and a shard of glass set Syd on a course of self-destruction. Will new friends and her love of the stars be enough to pick Syd up from rock bottom and guide her to the path of forgiveness and redemption? It was surreal seeing someone in the mirror, not me, legs looking like she'd tussled with a tiger. The person in the mirror was a stranger to me, but I chose to be her, didn't I? I wanted to be someone else and now I was. "Yeah when I get stressed, I take a piece of glass and cut into my leg." Wicked," he said. "Does it hurt much?" "It hurts more not to do it." "What I'm doing here the cutting it helps. I don't know why, but it does. It helps me let go of all the crap, all the pain I've been feeling." I love books that deal with hard issues. When done right they are often heart breaking, and in the end an emotional ride that will stick with you. Megan Bostic, has created a book that was powerful and will undoubtedly stick with me. There is no doubt that the words in these pages will cause some to turn away, or go misunderstood by others. However, for many this will be the book that you read because you understand that people go through this, struggle with this all the time. The writing and story supporting this young girl, is well researched and written in such a way that you will feel the power behind her story. The plot and pacing in this book are wonderfully done. With something like this, there can be no rushing, and go to slow and you will lose the power of what you are trying to convey. This being said, Dissected was powerful. This story following the downward spiral of a girl, that did not quite know how to manage the falling apart of everything she thought was steady in her life. What I liked about this was that it did not all happen in one quick sweep, it was a series of events that ultimately pulled her down. The failure to find a non destructive way to cope and being around people that are a different kind of destructive, cause the problem to compound and eventually blow up. However, the fact that the author takes us beyond the peak of everything, also gives us a glimpse of what the after could be. Syd... Where can I even start with her. There is so much truth to what this girl goes through, there are times it is almost painful to read. I am not talking about her heartbreak because most of us have been there, but the struggle with an outlet for the pain and anger she feels. I know there are people out there that will see Syd as weak but truth be told she's not. Her issue is that she does not know any other way to deal with it... However, given the chance and the right help she can get past it. She doesn't want to hurt the people she loves and is able to learn that despite how she thinks, people do love her. Syd's journey was not an easy one, nor is it one that is uncommon in younger females. My heart went out to this character and I saw her as a real girl going through real issues. There is not much to say in the romance department, because really it was the start of the end for Syd. To be honest, I did not really like David right from the start. His character could seem loving and genuine but there was always something that screamed he was scum. The other characters like her best friend Haley, I found myself wanting to like but couldn't. She was another character that was victim of a mistake, but even one that I found myself pissed at. There are certain things that are unforgivable in a best friend and she crossed a couple of those lines. Zach, was underestimated in the scheme of things. He's that character that could have been good for everything and helped many situations be avoided, but never got the chance. I found myself feeling bad for him and wishing he had played a bigger part in things. 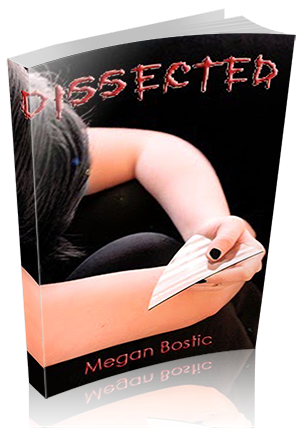 Dissected was a potent, powerful and heartfelt read, though not in the romance sweeping you away way. This read is meant to show you the harder side of things, and that sometimes people can't easily find a way to deal with the pain they have. This is not a book for someone that is looking for something light to read, it is meant for the people that can handle the more dark and heavy issues surrounding teens. However, if you are looking for something that is heavier, and is well written Dissected is a book that you will not regret picking up. Hi, I’m Megan (pronounced with a long ‘e’). I am the mother of two crazy beautiful girls, living in the rainy, but lovely Pacific Northwest. I’m the most unorganized person I know, but for me, it works. I have an unhealthy obsession with sock monkeys, love pizza, soccer, the color black, kickboxing and the sun. As far as my writing goes, I like to write about the hard things in life, stories that make people think and feel— that resonate with them for days. Part of my goal is to live life profoundly, with enough passion and adventure, maybe a little chaos, so that I may become a great writer. I aspire to never stop learning and growing and to continue trying to perfect my craft. One of my favorite functions as a published writer is to inspire others. I love visiting schools and libraries and motivating aspiring writers to finish their stories and never give up their dreams. When not writing, I’m trying to get my kids to clean or do homework, watching my older one play soccer, my younger one’s music gigs, listening to sad songs, hanging out with friends, strolling the ocean beaches, or walking the Narrows Bridge.